The best laid plans can go awry when shifting deadlines, large workloads, and family schedules get in the way of even the best intentions. And while procrastinating may help us feel better right now—Netflix binges certainly beat spreadsheets as a form of entertainment—we pay for it with late nights or missed deadlines. One of the best ways to ease into productivity and the peace of mind it affords is to make a to-do list. Lists force us to identify concrete, actionable goals and help us remember important information so tasks don’t slip through the cracks. Here’s how to create and maintain a to-do list that actually works for you. MIT stands for most important tasks. After you’ve created the day’s to-do list, re-read it and note which tasks absolutely must get done that day. Then devote yourself to accomplishing those tasks before anything else. While you may not get to everything on the list, tackling MITs each day will help ensure nothing critical slips through the cracks. This can be a great way to begin the morning on a productive note and minimise anxiety for the rest of the day. Since we tend to put off the tasks we want to do the least, eliminate wasted time and nervous energy by getting right to it. Not only will you get the dreaded tasks out of the way, but you’ll also give yourself a boost of accomplishment early in the day. If you need to create a presentation for the big board meeting, for example, don’t sit down to work until you gather all the necessary materials (fact sheets, data tables, etc). That way you can really focus until it’s done, instead of getting up to grab a new item every few minutes. Whenever you commit to doing a task, really commit. Close all internet browsers, silence your phone, and sign out of email and social media accounts. Keep your workspace organised too—clutter can serve as a distraction. By creating a space that enables you to focus, you can get tasks done quicker and get on with your day. Productivity feels great, but it’s important not to obsess about it. Too much productivity can be a bad thing if it prevents us from taking care of ourselves, maintaining healthy relationships, or enjoying proper rest and relaxation. Be sure to schedule small breaks throughout each day to do something you truly enjoy (or do nothing but breathe). And try to unplug completely one day each week in order to recover from a busy schedule and prevent burn out. Ultimately, prioritising downtime and self-care is one of the best things you can do for your productivity levels—by staying healthy and happy, you can remain productive for years to come. Morning didn’t go as planned? It happens to the best of us. Instead of declaring the day a wash, commit to re-starting after lunch. A lot of things can still be accomplished in the afternoon, and doing something sets you up for a less stressful tomorrow. Writing down everything you need to get done for the rest of your life on one piece of paper is a quick way to feel overwhelmed—and that’s a surefire way to kill motivation. A master list that outlines everything you want to accomplish down the road (for instance: take a yoga class or remodel the bathroom). A weekly project list that details everything you need to do over the course of each week to keep things humming along smoothly. A daily list that outlines the must-dos for each specific day. Try to limit this list to eight items or fewer to make sure you’re not overscheduling yourself. This practice requires you to assign due dates to each task, which ups the chances of completing tasks. Also make sure to schedule time to tweak these lists on a daily, weekly, and monthly basis. While it may seem counterintuitive to spend time planning how to spend your time, categorising tasks appropriately is a great way to free up mental space and focus your energy where it’s really needed. Aim to review to-do lists in the evening so you can hit the ground running the next day. Wherever possible, include the information you need to get the task done (your accountant’s phone number, for example). Aim to craft the list so every task requires only one single action. Not only does this help tasks feel more manageable, but it provides a better sense of how much time to allot for each item. Put digital tools to work for you by using a timesaving app. There is a huge range of to-do-list-enabling apps, from incredibly detailed schedule managers to location-specific reminder systems. Experiment to find the one that works best for you. Any task that can only be completed through a series of steps qualifies as a ‘task series’ (for instance packing for vacation or cooking a weekly dinner). Create action sequences for any tasks you accomplish on a regular basis so you don’t need to re-create the to-do list each time you perform that action. Instead, you can just refer to that task series whenever you need it. And so on. Apply this tip to a monthly business presentation or organising your office. Each time you conduct one of these tasks, simply refer to the task series. You’ll free up a ton of mental energy that would otherwise have gone into re-creating the task series from scratch. Some tasks—such as making the kids’ lunches or responding to emails—need to happen every day. Put them on autopilot by scheduling them for the same time each day. That way you won’t lose any mental effort to figuring out how to squeeze them in, which frees up your brain to focus on those MITs. 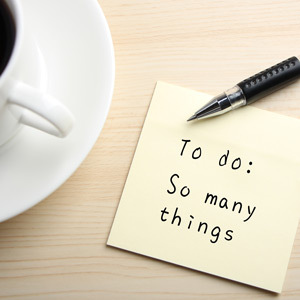 As this list proves, there are many steps you can take to make a to-do list feel less daunting. But at the end of the day, all the tricks in the world can’t compete with this simple step: start. Put in the legwork to create a tailored, effective task list as outlined above—and then get to work. You can do it. This piece was first published as an infographic at Quill and has be reproduced with permission. Laura Newcomer is a writer, editor, and educator with multiple years of experience working in the environmental and personal wellness space. Her writing has been published on Washington Post, TIME Healthland, Greatist, DailyBurn, Lifehacker, and Business Insider, among others. Laura Newcomer has written 1 articles for us.